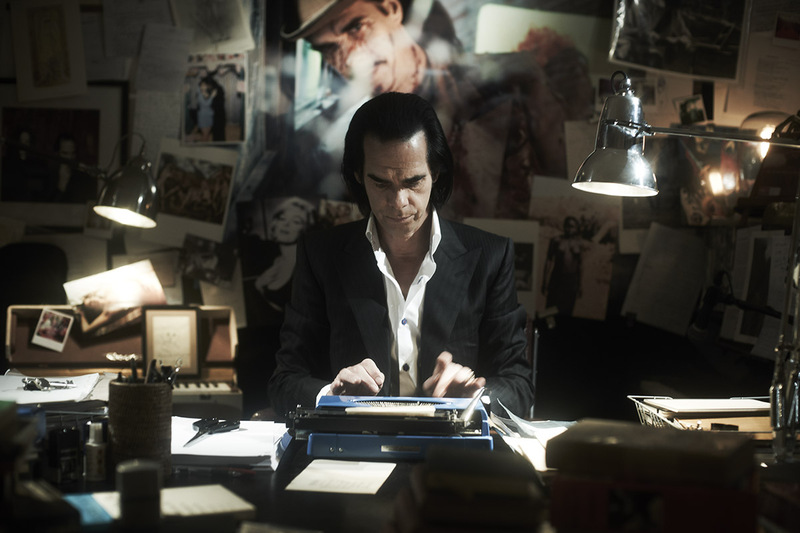 “At the end of the 20th century I ceased to be a human being.” So says Nick Cave at the top of this idiosyncratic film. Part documentary, part concert film, part drama. Cave’s comment is provocative. Is it self-aggrandising? It seems to be, as several times throughout 20,000 Days On Earth he refers to rock stars (himself included) as gods or angels. The statement suggests he has risen above us all to another place. And that we put him there. A perennially cinematic songwriter, Cave is no stranger to the wonderland of cinema, having penned screenplays (Lawless, The Proposition) and scores (numerous, including The Assassination of Jesse James by the Coward Robert Ford with long-time Bad Seed Warren Ellis). So it is telling that this opportunity to capture his legacy is knowingly imbued with exaggerated drama. His cinephile self extends to that opening statement. Soon after it appears as narration, Cave is shown examining himself in a wide bathroom mirror; a shot wholly reminiscent of David Bowie in The Man Who Fell To Earth, where the pop legend portrayed an alien. Cave clearly relates to this otherness. But where Bowie’s appearance suggested an enforced outsider status, 20,000 Days On Earth portrays Cave as a man asserting his own position. This film represents another step in refining his own legend. Directed by Iain Forsythe and Jane Pollard, 20,000 Days On Earth is a strange beast, and not just because of its quixotic nature – one moment we’re observing studio sessions from the Push The Sky Away LP, the next Cave is having staged conversations in his car with the likes of Ray Winstone. No, Cave’s fluid approach to the truth about himself is repeatedly decanted into different vessels. Perception is a constant theme here. If you’re coming to 20,000 Days expecting a revealing tell-all or confessional (as the trailer readily suggests), you may be in for an unexpectedly slippery experience. At times Cave seems wholly sincere and truthful. When he and Ellis reminisce about a transformative Nina Simone gig, or when he speaks of how the rainy seaside town of Brighton has become his home, the viewer can sense the honesty in the words. Those barriers dropped. There’re even psycho-analytical conversations with Darian Leader that take place in what appears to be Leader’s office, scenes in which Cave opens up about his childhood and his then-omnipresent father… except this isn’t Leader’s office. It’s a set. Staging. Cave keeps us on the back foot even when we think we’re getting close to him. This is entirely deliberate, of course. Cave understands implicitly that part of the magic of his particular type of celebrity is the mystique of it all. Watch the live scenes as he touches fingertips with tear-streamed fans, whispering to them, communing with them, but towering over them also. His showmanship is superb, but it works so astonishingly well because he understands that the rock-musician-as-superhuman fulfills some new element in our cultural psyche. That strangeness, that otherness is key to his success, and it needs to be maintained. It’s apparently an obsession of his, amplified in his self-indulgent conversations with Ellis, Winstone, Leader, former-Bad Seed Blixa Bargeld and one-time collaborator Kylie Minogue. Another section of the film sees Cave overseeing work in an archive devoted to his entire life. An old will and testament from the 80’s sees Cave wishing for his remaining wealth to be devoted to a memorial museum to himself. This archive seems like a depository for all applicable artefacts. It must be a strangely distorting sensation to have your life so thoroughly documented. In a way 20,000 Days On Earth illuminates the funhouse-mirror reflections wrought by fame. Cave co-wrote the film with Forsythe and Pollard, allowing himself further control over which version of himself is presented to us. His natural showmanship steers the film, meaning that we only ever get the version of Cave that he wants us to see. Which is not to say that this is merely a puff-piece; Cave is open and upfront about his troubled past with drugs. Yet there is always a sense of artifice about 20,000 Days. The real Nick Cave is in here in pieces, but his urge to maintain a veneer of mystique makes him a tricky beast to pin down. In his songs we meet an accentuated version of Cave, and so it goes here. Nevertheless, for all it’s masquerade, Forsythe and Pollard’s film is a thoroughly engaging one, and probably represents the best film about a rock act since Dean DeBlois’ Heima followed Sigur Rós on their homecoming tour of Iceland. Like that film, 20,000 Days On Earth excels for pinning the aural aesthetics of the artist to an applicable visual sensibility. Sigur Rós were reflected in Iceland’s expansive landscapes; here the mood of Cave is captured in the interiors of cars, piles of meticulous journals or a roster of stiff-collared shirts. While the film’s centrepiece is a session take of Push The Sky Away highlight “Higgs Boson Blues”. I’m a fan of Nick Cave & The Bad Seeds. Watching 20,000 Days On Earth I tried to divorce myself from that connection and view it objectively. I don’t think I was entirely successful. I’m not sure how newcomers would find this man and this film. I’ve tried to score it below based on its merits as a film and as an enjoyably canny obfuscation. Die hard fans can add a point. Those approaching Cave for the first time might do well to remove one. Cave admits to being terrified of losing his memory, yet this film feels like a trick-version of the truth; another story for his audience. If Cave wants an accurate keepsake – if his fans do – this may not be it. Like so much of his work, its a wonderfully romanticised snapshot. Kylie tells him that she speed-read his autobiography. He dismisses it’s veracity. What’s true, what’s not? The proposition here appears to be that it doesn’t matter what’s true. The legend is true. Previous Pretty Vacancy: Is AVP: Requiem The Worst Film Of All Time?